Congratulations, you’ve made it with your A level grades or diploma GPA to be offered places in Singapore-based universities! Whether it’s a reputable course at local unis or your dream course at a private university in Singapore, you’re going to have to eventually choose. While most may feel that local public universities are cheaper, it’s also important to choose a bachelor’s degree program based on affordability, financing options, employment outlook and the overall value you can get out of your university experience. For example, if you have been offered a Business course at SIM vs an Arts and Social Science course in NTU or NUS, which should you choose? You want to make your three or four years of studying count, knowing that it will lead you to career opportunities of your interest. Paying for your own education is a form of self-investment, apart from the time and effort you’ll be putting in to earn that degree. Considering the financial costs of local uni vs private university in Singapore, you may think that a local uni is cheaper and offers more prestige. However, taking up your dream course in a private uni, who is renowned in the industry is an equally sensible move. A degree is afterall a passport that opens doors to opportunities related to your course. The total fees for your university education are dependent on your citizenship and qualification for government grants. 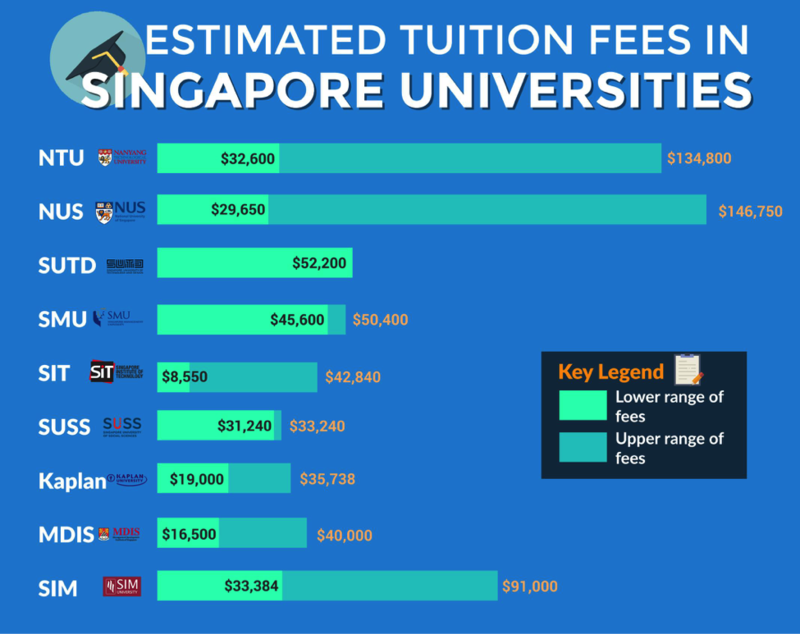 Here’s a table on estimated tuition fees in Singapore universities, according to statistics compiled by BankBazaar Singapore. Nobody wants to waste three to four years in a course that he or she does not enjoy. When you are offered a course of your choice which even suits your personality strengths, it does not immediately guarantee success in the long run if you are still unsure about long term career prospects and industry developments. It’s also easy to regret pursuing your bachelor’s degree if you’re unemployed after finishing your degree. To prevent this, give yourself the head start by reading up on the industry you’re interested in and actively seek out internships or part-time jobs. Do your best, set goals for yourself and build your networks in the field from day one. You can speak to current students or alumni from the courses which you’re thinking of and get their opinion. 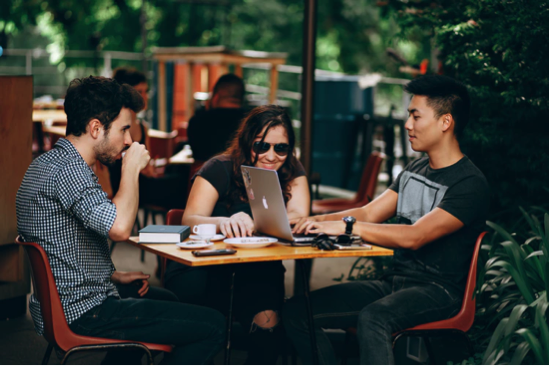 Join online career support groups such as the Glints Career Hacking Community, where there are students and professionals who would love to share their career advice and experiences with you. Doing an internship or meaningful part-time work after your diploma or A levels, before you commence your bachelor’s programme, is great for self-discovery and exploration of possible careers. Other than finding out about the actual skills and experiences valued in the industry, it also gives you a sense of direction of what part-time jobs you can take up when you’re enrolled in university. 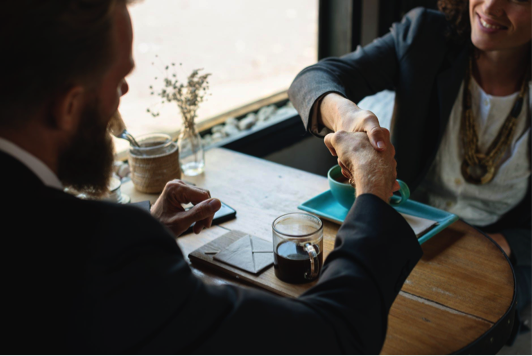 Every step along the way adds up to your success in securing a dream job offer upon graduation. Someone from a private university in Singapore will have a lower rate of securing full-time jobs. They’ll also draw lower starting pay compared to public university grads. Graduates from a private university in Singapore might face a starting pay of $2,700, so take note. However, this is not the case for MNCs, which do not discriminate graduates from public versus private schools. Your first salary does not determine what you will be earning in the long run. Career progression and industry trends will factor in here. 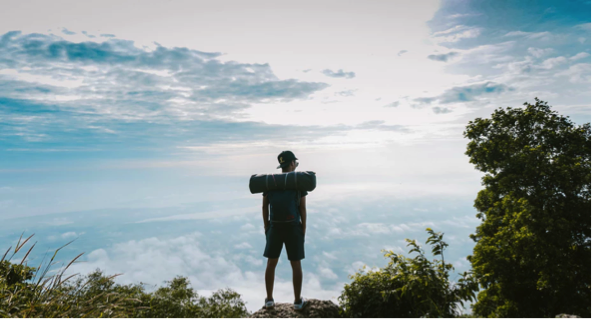 Pulling your weight and being responsible for your own career path planning and factors such as increment trends and generosity of your company come into play. If you are from a public university, feel free to consider jobs from any sector. 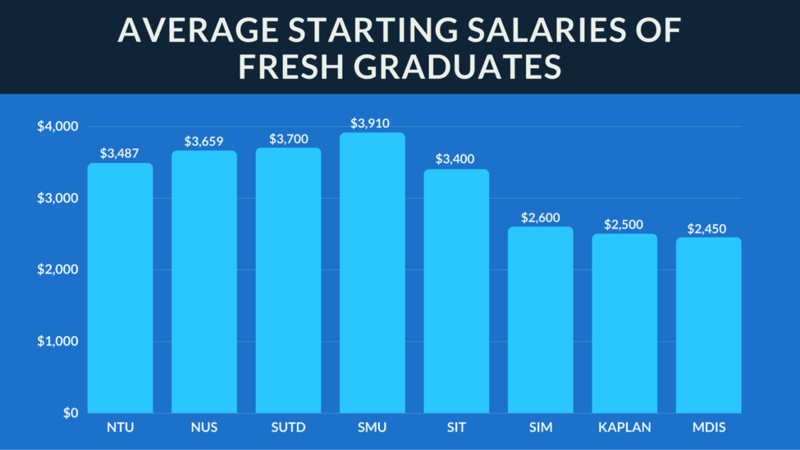 If you are from a private university in Singapore, you should first compare salaries offered. Once you’ve secured your first job, employers will not pay much attention to which university you’ve attended. Instead, they will be looking at the skills and expertise that you can offer. Universities offer more than just a classroom experience. Tap on the resources available such as the Careers Affairs Office or the Exchange Programmes Office. Choose the school which is known for a particular specialisation or close industry connections for your internships. You’ll also need to consider opportunities for international exchange or overseas internships if you wish to go for these. If you do not wish to rely on your school’s careers office alone, self-source for internship opportunities, locally or abroad. It’s more than just paying for a piece of paper or a ticket to success based on a degree. You are investing in the opportunity to shape your future career path and network. You will also be forming meaningful relationships with your lecturers and classmates. Employers value the right skills, attitude and drive when you’re entering the workforce officially. Sp whether you’re going for a local university or a private university in Singapore, the world is still your oyster!